Being passionate about how early exposure to music supports all aspects of child development, Monkey Music’s founder and CEO, Angie Coates is often asked by new parents, why and how music is good for their babies. Here she writes about becoming auntie for the first time and how her own children are teaching their new baby cousin to speak using musical sounds and actions. Language development is one aspect of early development which is enhanced by early exposure to music. 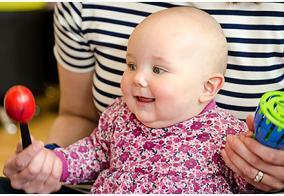 Babies love to listen to voices, and very early on they will recognise the tone, rhythm and pitch of a familiar voice. During her first year, Lotta will pick up all the sounds she needs to know so that she can learn and develop the ability to speak in her ‘mother tongue’. As she is a relatively new born baby, she will still have the ability to perceive any phoneme* she hears but that ability will be lost within the first year. In listening to the girl’s sing-song, Lotta is grasping elements of her native language. She will practise making these sounds in preparation for producing her first recognisable words in a couple of months. The accompanying rocking and jiggling actions are not accidental. Research has shown that when we move and sing at the same time we engage nearly all of our brain, which enables us to translate and store new information very efficiently. It's never too early to expose your child to live music. Go along to local dress rehearsals for shows and concerts and stop to watch the buskers and live bands on the High Street. Instead of humming the tune of your favourite nursery tune, use different sounds to make up the tune - this way you are allowing your child to hear single syllable and vowel sounds from their mother tongue …ba ba baa baba ba ba ba ma ma maaaa dada da daaa! Try to punctuate your day with familiar tunes and rhymes so that your child associates a happy routine with positive musical sounds. For example, you could sing a 'getting up and getting dressed song' and a 'getting ready for bed song'. This allows the child to hear your voice, which is their most preferred sound of all. Dance and sing all the time! Attend a local baby music class. Have musical toys and baby friendly musical instruments around for your baby to play with. As Lotta builds her sound bank, I know that it won’t be too long before she is asking her cousins to do a little bit more than just rock and sing to her! Source: Dr Carla Hannaford, Smart Moves: Why Learning is not all in your Head. *Phoneme - A phoneme is the smallest contrastive unit in the sound system of a language. A meaningful sound is one that will change one word into another word. For example, the words cat and fat are two different words, but there is only one sound that is different between the two words - the first sound. Most languages contain about 40 distinct phonemes. One month old babies are able to tell the difference between a 'b' sound and a 'p' sound.